Numark High Strength Cod Liver Oil contains Vitamins A and D3 and unsaturated fatty acids EPA and DHA for which there is increasing research to suggest that these fats support heart health. 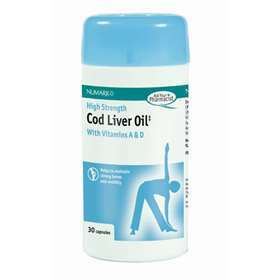 Cod Liver Oil can help to maintain healthy joints. Helps to promote healthy hair, skin and nails. x30 capsules in a sealed plastic pot. Dosage: For adults and children over 12 take 1 capsule daily with food. Please note: It is advised that pregnant women take no more than 800µg of Vitamin A per day, therefore it may be useful to try and alternative source of DHA and EPA such as Flax Seed Oil instead.